*Leap 90 Discount does not apply to Luas – Luas or DART/ Commuter Rail – DART/ Commuter Rail as these trips already have specific discounted fares. Which trips benefit from a Leap 90 Discount? Leap 90 Discount does not apply to Luas- Luas or DART/ Commuter Rail – DART/ Commuter Rail as these trips already have specific discounted fares. The discount happens automatically on the applicable services when you use Travel Credit to pay for your trips. There is no need for you to do anything, the discount is automatic! Eg: If someone makes a journey on Dublin Bus and travels on Luas within 90 minutes of using their TFI Leap Card on their first trip on Dublin Bus, they will receive an automatic Leap 90 discount for the Luas fare. The Leap 90 Discount will continue to apply if the user travels within 90 minutes of their last journey. What Irish Rail services are applicable? 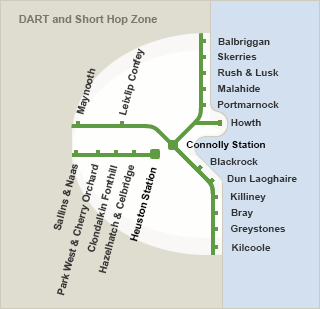 Leap 90 Discount applies to DART/Commuter Rail services in the “short hop zone” as shown below. Does Leap 90 Discount apply to all Dublin Bus, Go-Ahead Ireland, Luas, DART and Commuter Rail trips? It applies to all Luas journeys that are preceded by a journey on Dublin Bus, Go-Ahead Ireland or DART/Commuter Rail using TFI Leap travel credit that were commenced within the previous 90 minutes. It applies to all DART/Commuter Rail journeys that are preceded by a journey on Dublin Bus, Go-Ahead Ireland or Luas using TFI Leap travel credit that were commenced within the previous 90 minutes. It applies to all Dublin Bus journeys (excluding Airlink) that are preceded by a journey on Dublin Bus, Luas, DART or Commuter Rail using TFI Leap travel credit that were commenced within the previous 90 minutes. It applies to all Go-Ahead Ireland journeys (excluding Airlink) that are preceded by a journey on Dublin Bus, Go-Ahead Ireland, Luas, DART or Commuter Rail using TFI Leap travel credit that were commenced within the previous 90 minutes. When does the 90 minute start and end? The 90 minutes starts when the user touches on their TFI Leap Card on the first leg of their journey. The time between each boarding needs to be within 90 minutes. Does the Leap 90 Discount affect capping? No, capping operates in the background independently of the Leap 90 Discount. Once a customer hits the TFI Leap Card Single or Multi-Operator Caps for a day or week they won’t be charged any more that day or week. The customer will receive Leap 90 Discounts for each applicable journey until they reach a cap.